Scrap only the white portion of the coconut. Ensure soft scraping. Do not scrap the brown skin. In a heavy bottomed pan, add a ladle of water and sugar. Make a sugar syrup of 1 thread consistency. Add scraped coconut and stir continuously. 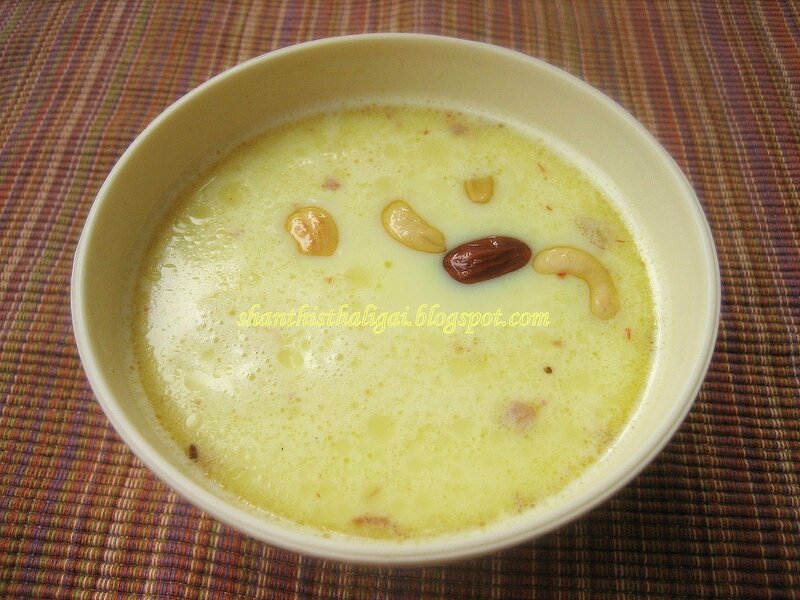 When the mixture leaves the sides and has white froths all over, add ghee, broken cashew pieces, cardamom powder and mix well. Spread on a greased tray evenly and cut into desired shapes. Thengai Burfi looks absolutely delicious. Happy Karthigai. awesome..n yumm dishes.. happy karthigai..
Aha Bakshanangallam pramadama irruku.Wish u a happy karthigai festival Shanthi and thanks for sharing the making of the differesnt delicious sweets too.Thenga burfi looks superb and sweet. Super duper good. Wonderful presentation as well. Thenga burfi looks super good...also loved the other karthigai recipes. Solla teriyalai.Burfi is so beauuutiful to look at and must be very delicious to eat.Your forte is your presentation skills and the excellent photography,Shanthi. Coconut burfi looks so good. Happy Karthigai. Super irresistible thenga burfi,feel like having some..Happy Karthigai deepam Akka. This is my favoriite..i too do the same way...this looks tempting and yummy. Happy Karthigai Deepam. Irresistible thenga burfi lloks so tempting,nice to see all Karthigai sweet recipes,happy Karthigai Shathi. 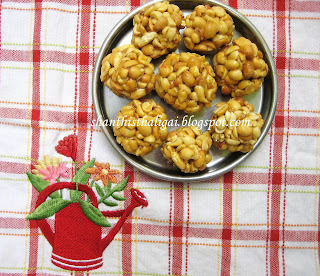 Happy Karthigai to you and your family.Lovely burfi recipe. They have come out so well and how perfect !!! Wish you the same and all the sweets do look delicious. Slurppp. .I can have all of the tengai burfi. Happy Karthigai.. Burfi is yummy.. 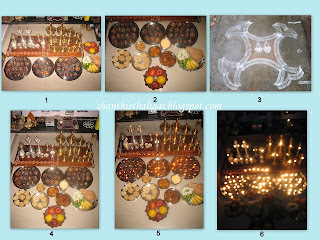 Happy Kaarthigai Deepam...Looks very beautiful.. I love this and have been making this for diwali for the last few years! 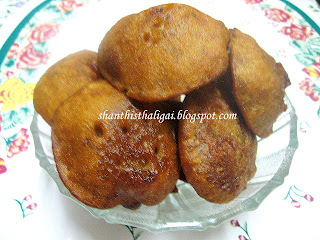 Those are some yummy treats for Karthigai. Thanks Shanthi for stopping by my space!! 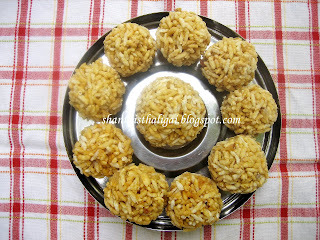 I learn this type of burfi to my southindian neighbors. 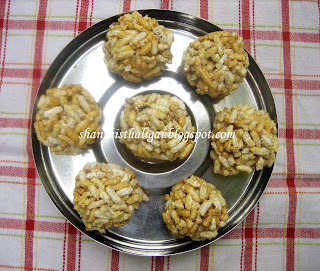 ur looks super white NEL PORI URUNDAI (we call murmura ladoo) ur blog is super and i like learn many recipes here. Thanks so much for sharing this. Aaaha..enakku venum maami! Supera irukku! Can you please tell me how many cups worth of grated coconut would 1 big coconut provide? The sizes here vary and hence would appreciate an approximate amount. Or the grated coconut:sugar ratio will also help. Thank you so much. Thank you so much for the quick reply Shanthi. Appreciate it.